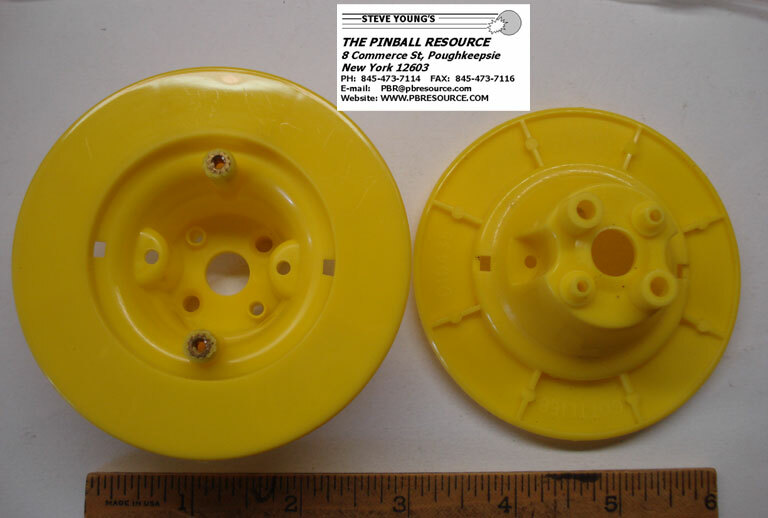 All of our bumper bodies are hot-stamped (unless otherwise noted) and are either NOS or are replacement parts, hot-stamped with the original tooling and dies, whenever possible. 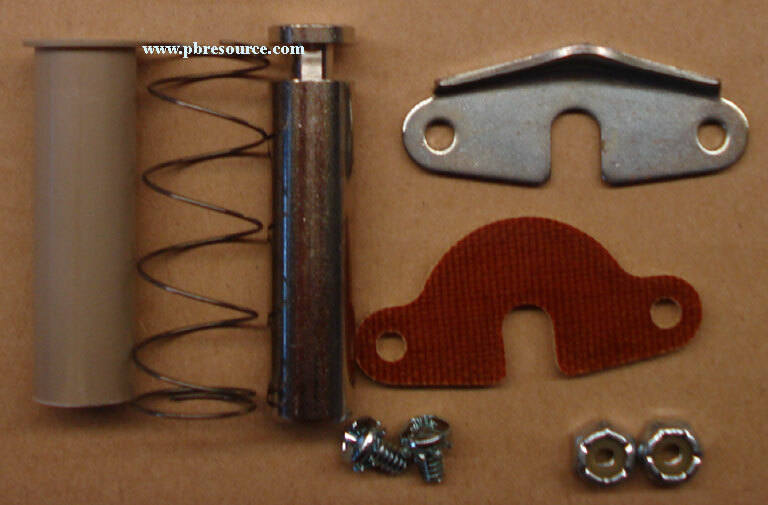 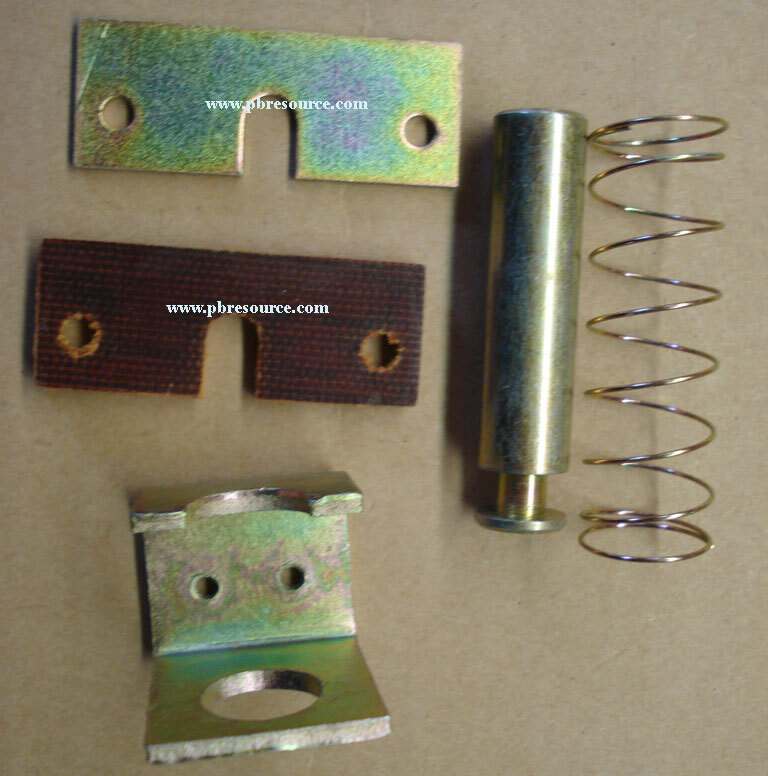 These replacement parts are hot-stamped in methods faithful to the original factory parts, done to meet or exceed the original specifications! 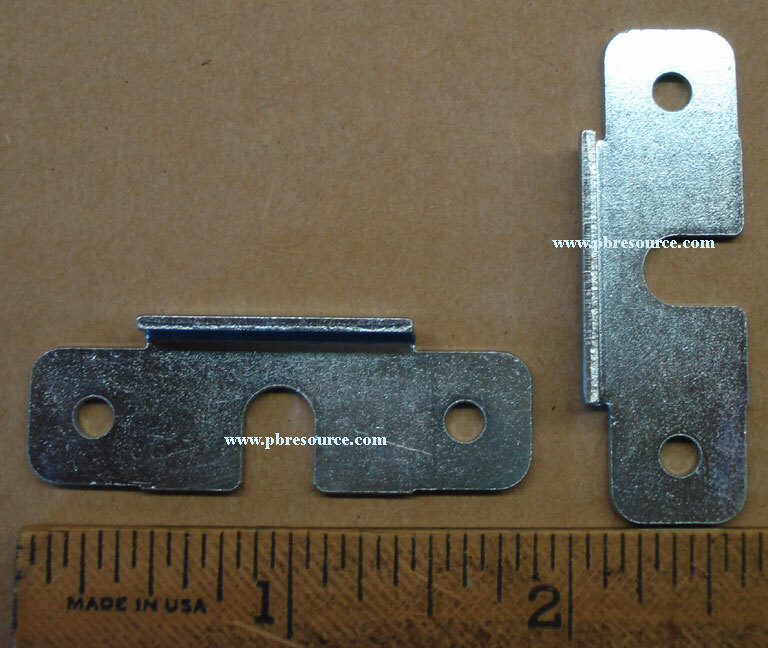 Looking to see a side by side view of the different bumper bodies, Click Here? 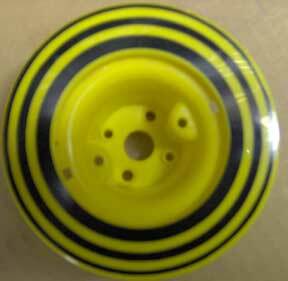 Color: Black, Blue, Red, Yellow, Purple or Green. 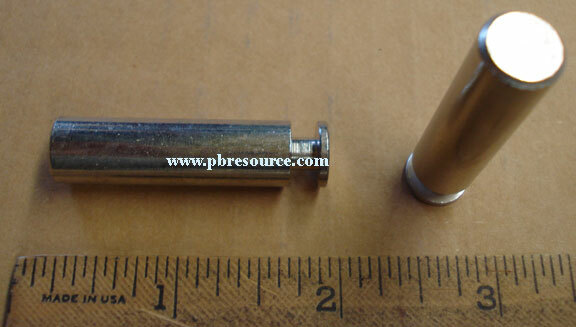 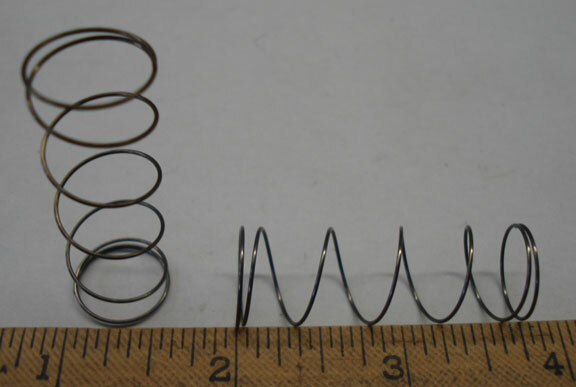 This Dead/Advance body takes a 1” Rubber Ring RIN-1. 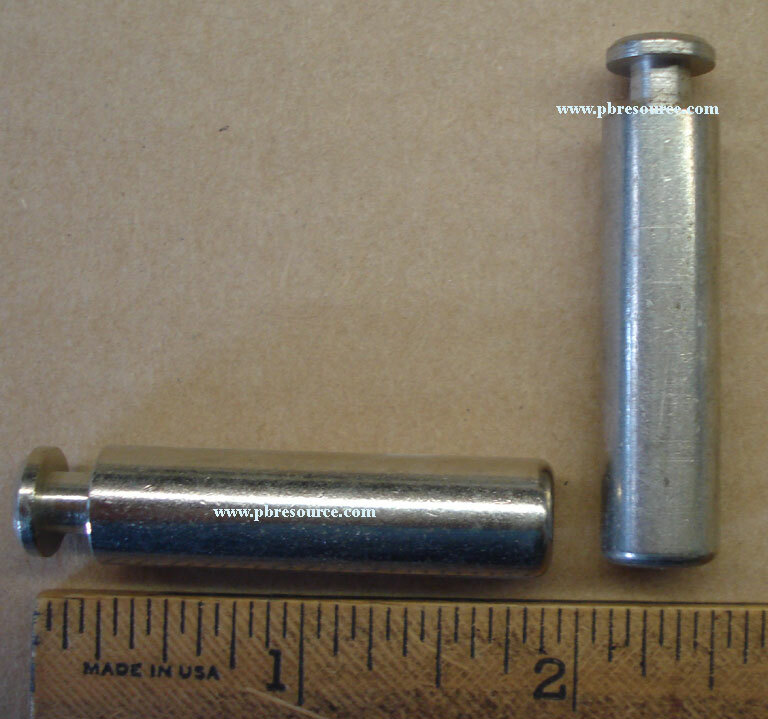 Original documentation called for a 3/4” rubber that will not fit our current bodies. 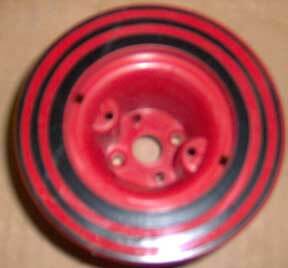 Typically this body takes a DECO style bumper cap - On a few games, it may have a Daisey Cap. 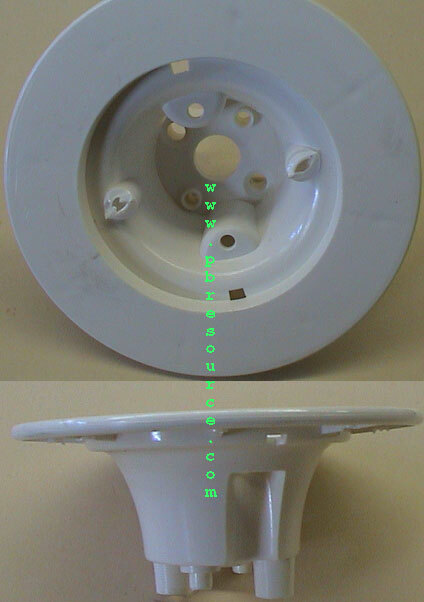 #=Williams documentation lists the above part number for this bumper body and for 8997 listed below. 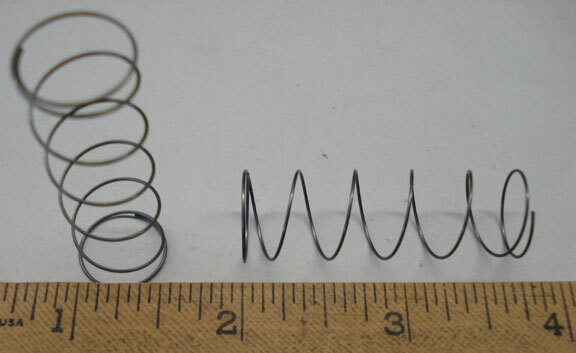 Typically this body takes a Daisey style bumper cap. 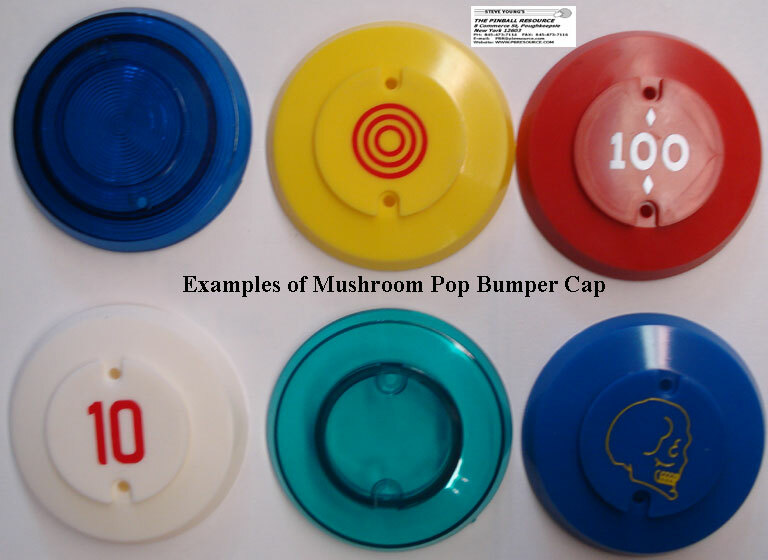 Typically this body takes a Mushroom style bumper cap. 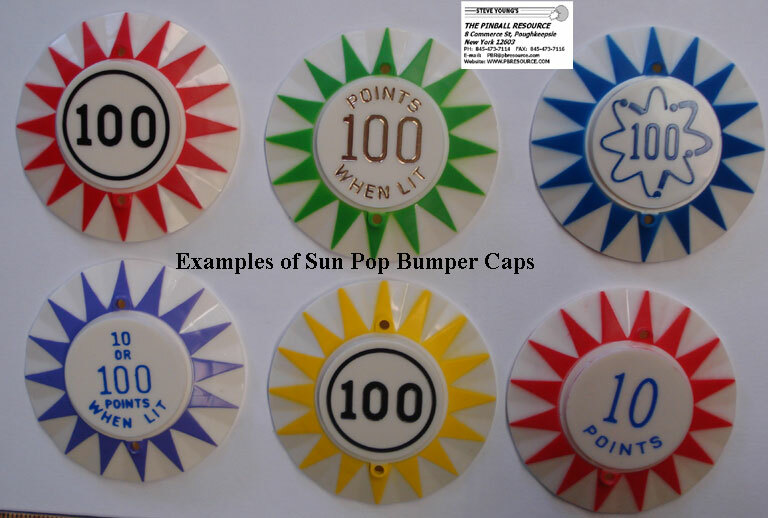 All of the above Skirts have the Points! 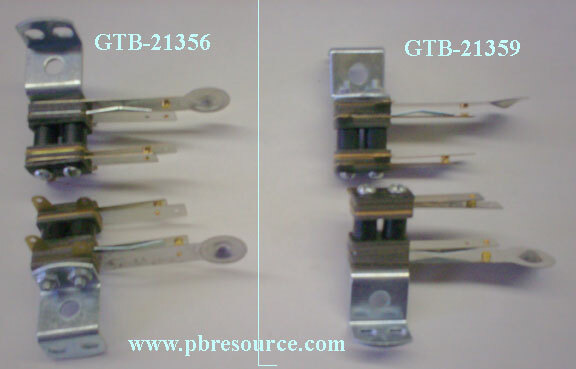 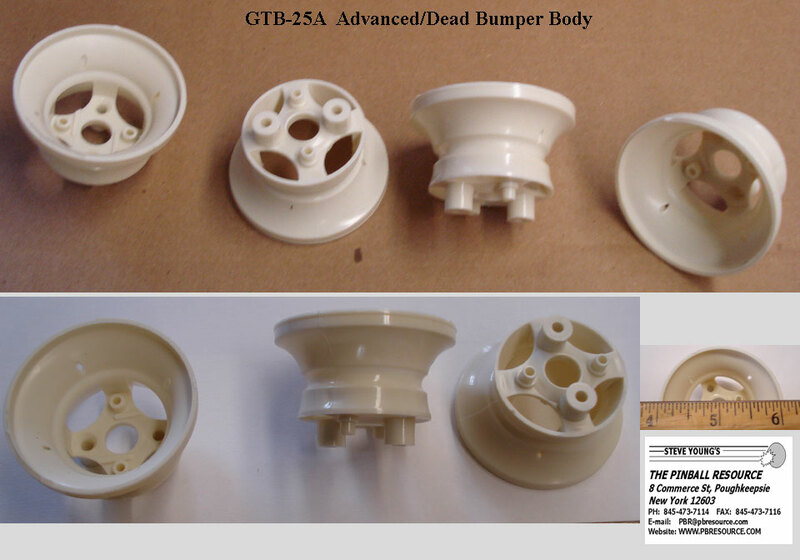 Used with GTB-25A Bumper Body listed above! 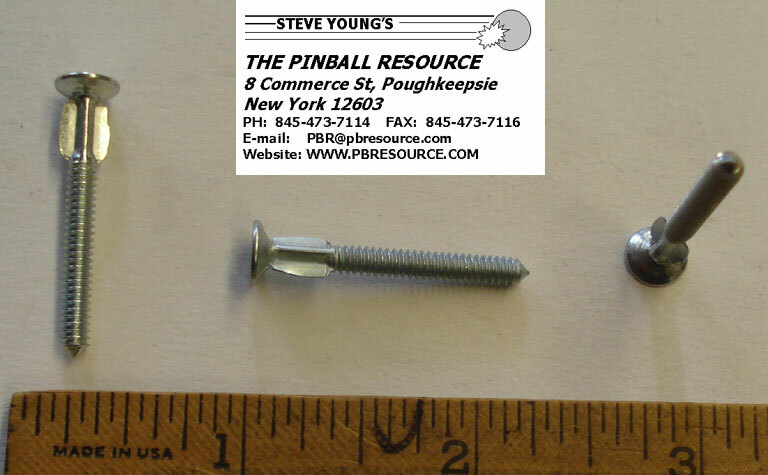 A1218P Purple -Note the purple color of this shirt does Not match our bumper bodies and caps! 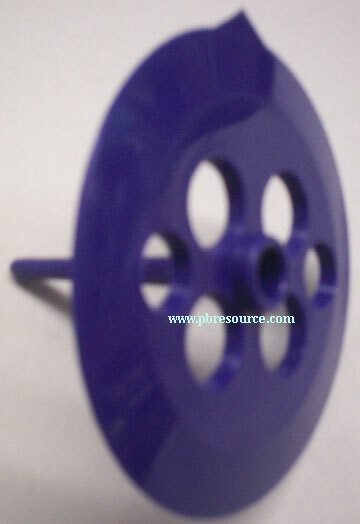 It is also different shade than the original Purple skirts! 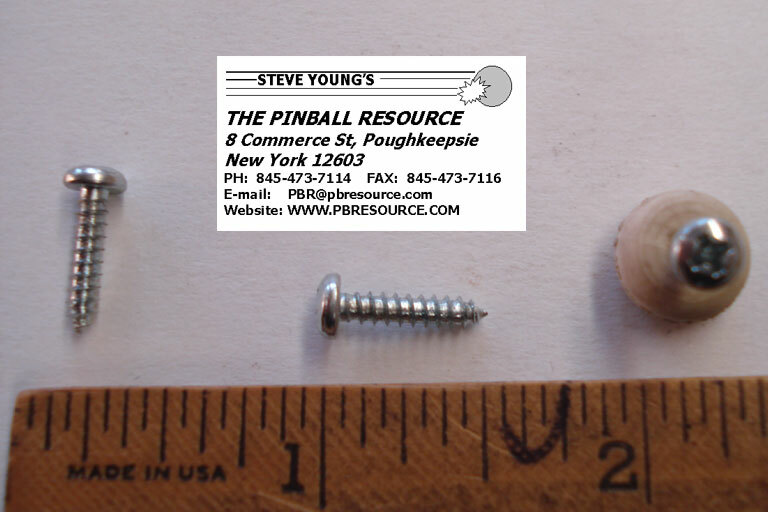 If you don't want the Points, simply cut them off! 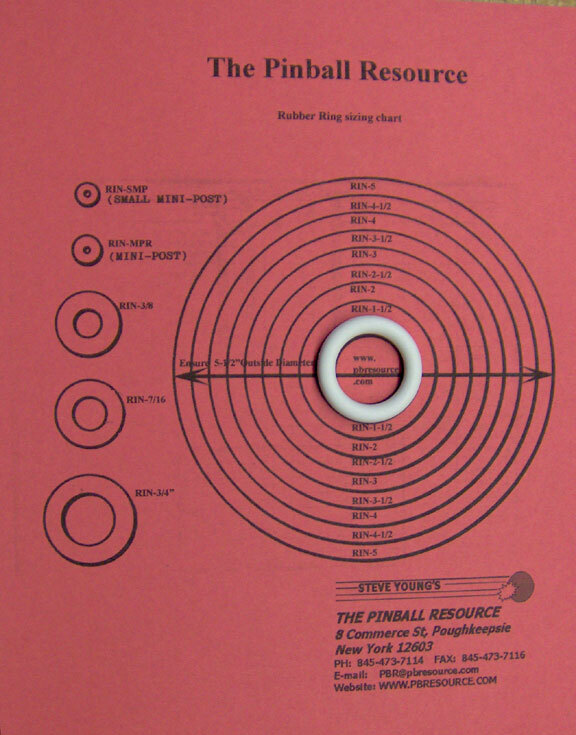 Same as Gottlieb Part C10433! 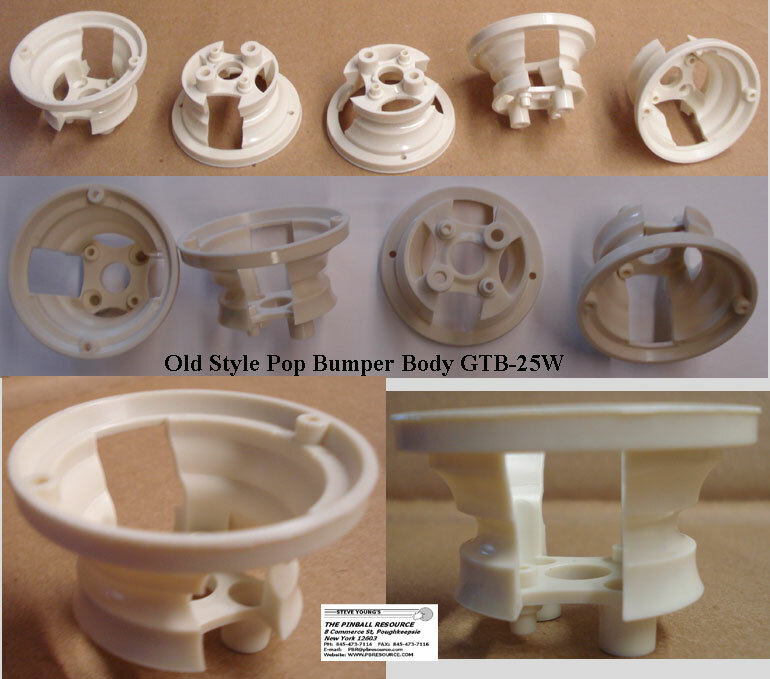 For those collectors who want NOS/Original Pop Bumper Skirts, we have stock on “Ivory” colored Pop Bumper Skirts without the point. 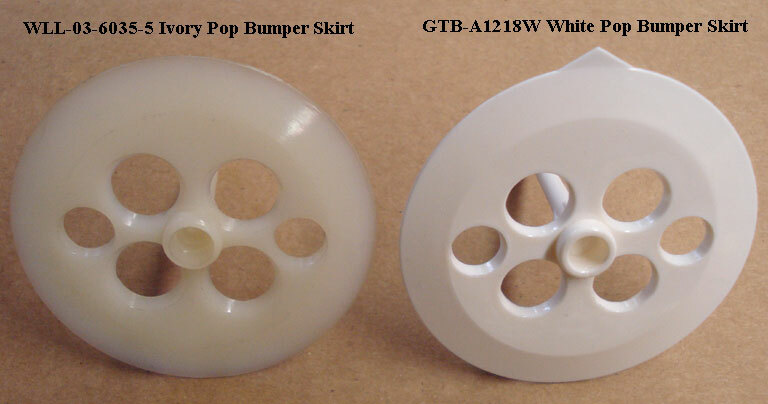 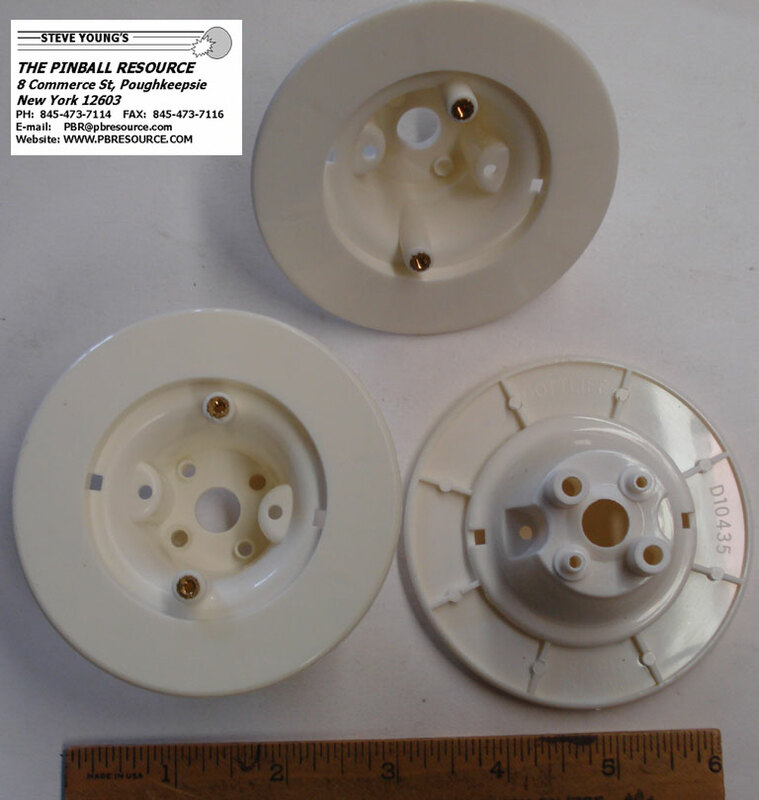 These “Ivory” colored skirts differ from our A1218W WHite listed above, Click Here to see the difference. 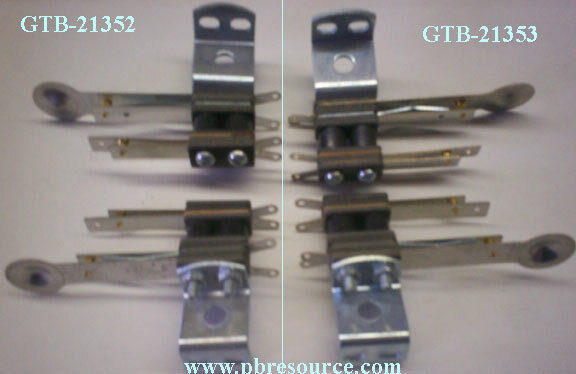 The only difference between the switches is the direction of the mounting bracket. 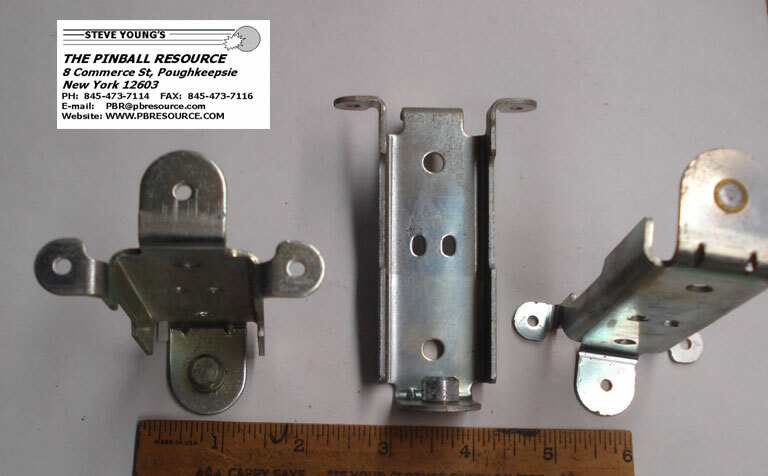 If you order the wrong one, just rotate the mounting bracket 180 degrees. 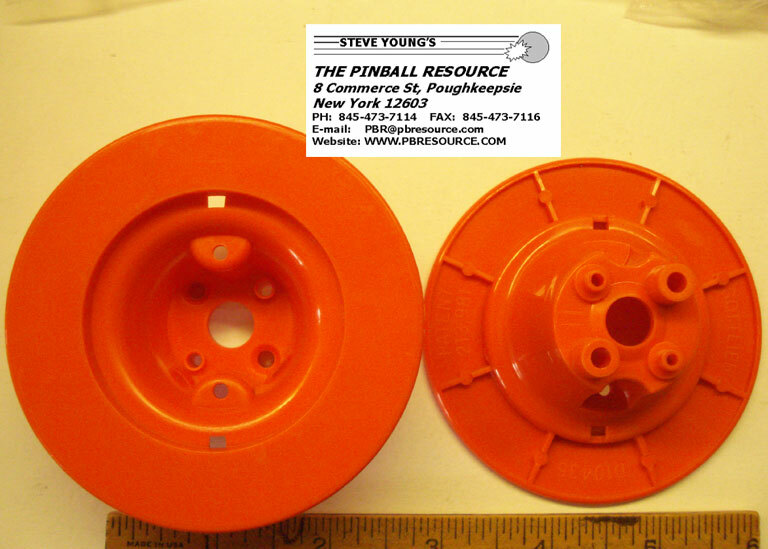 Used on Advanced/Dead Bumpers and Pop Bumpers! 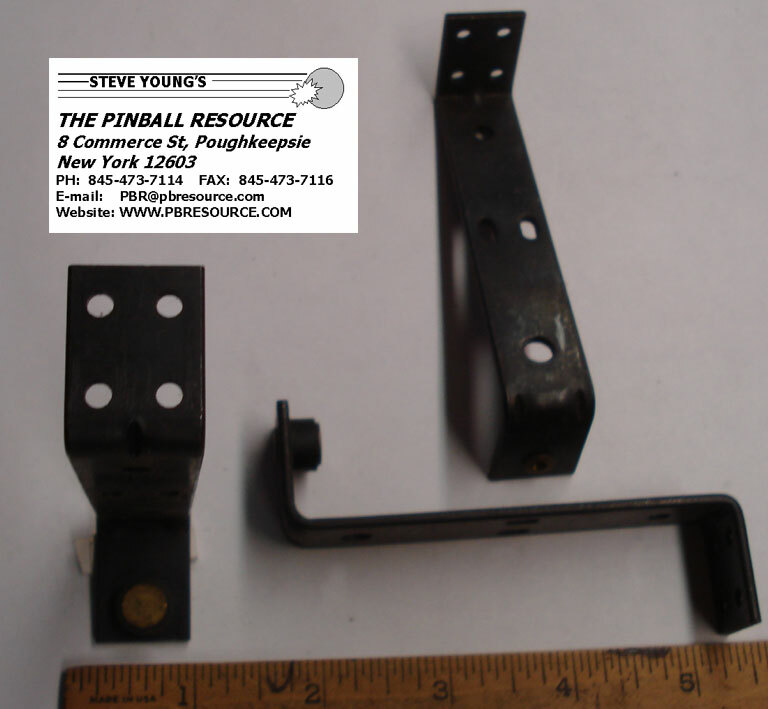 Used on Williams games from 1950's through End. 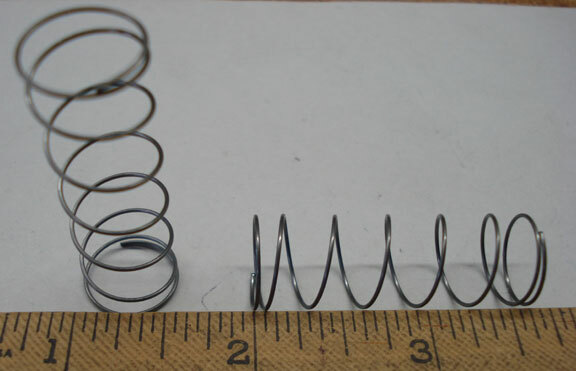 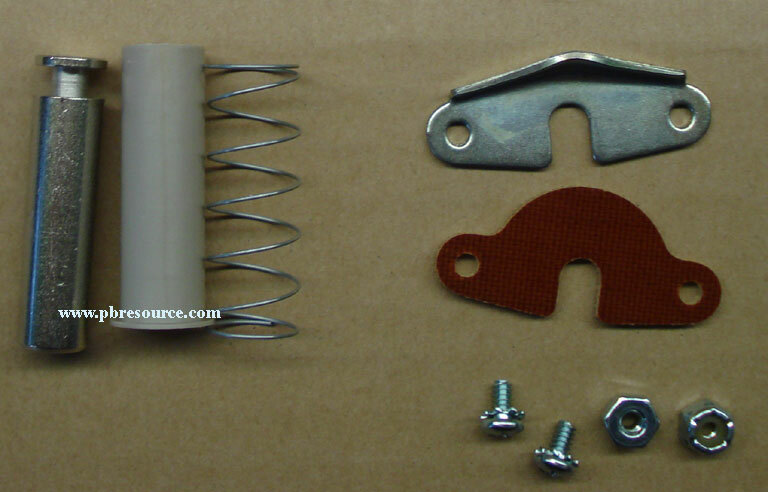 You can also use the above A4754 Rod and Rings as a substitute. 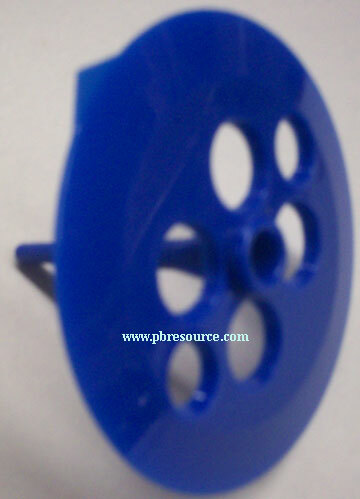 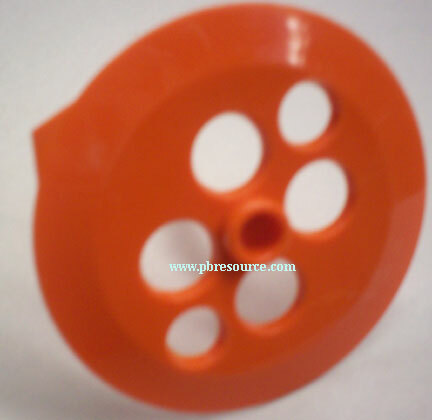 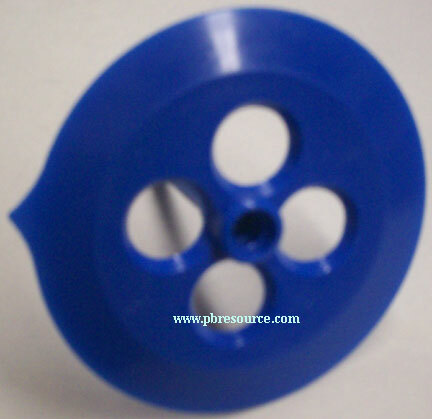 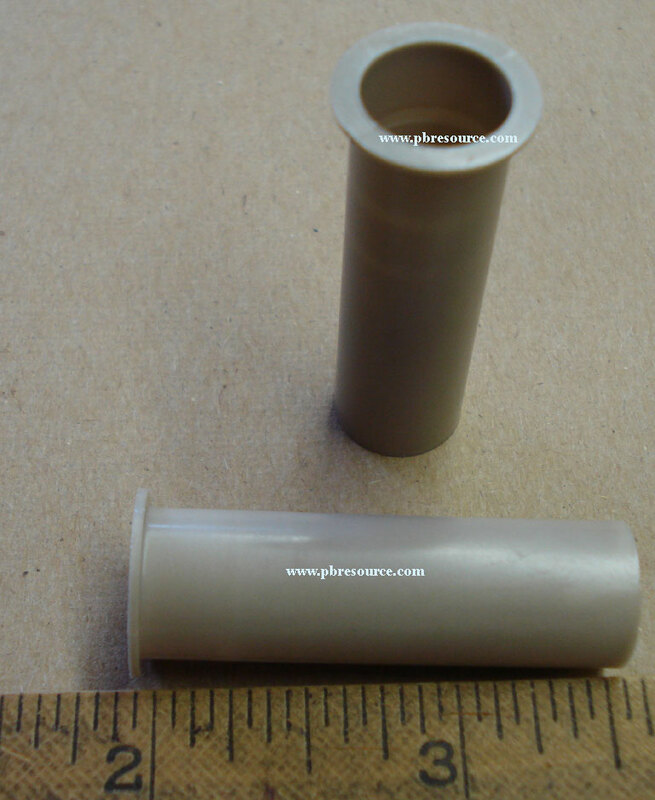 Original parts for Williams games that use the “Keyhole” cutout to attach to the plunger are NO longer available. 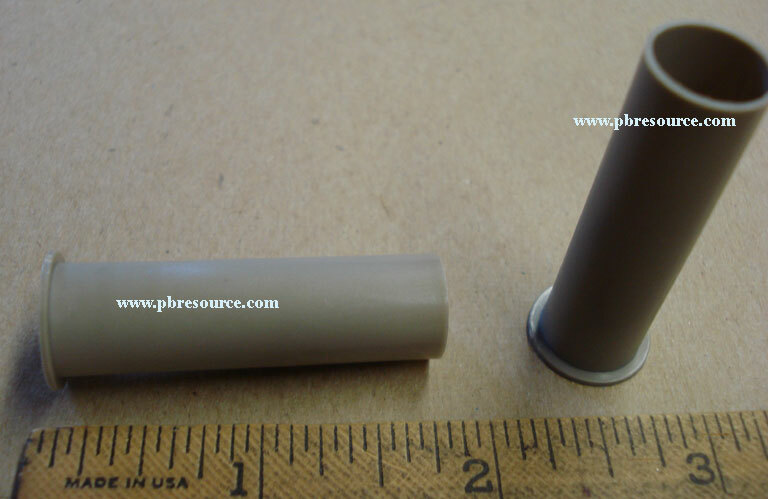 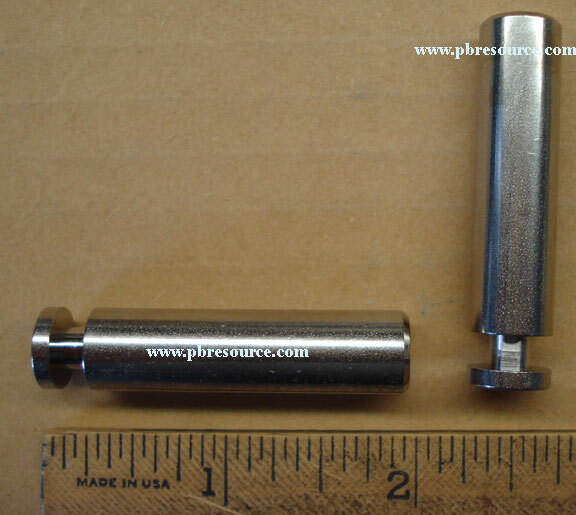 PBR has a solution - We have redesigned the plunger, which allowed us utilize the Gottlieb® bakelite and metal armatures with this new plunger to give new life to these tired assemblies. 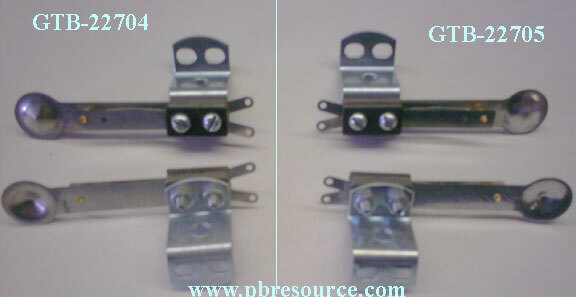 The original Metal and Fiber Armatures are No Longer Available. 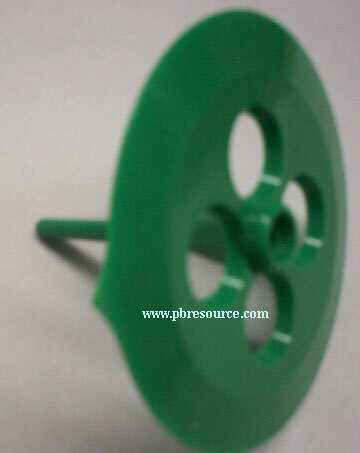 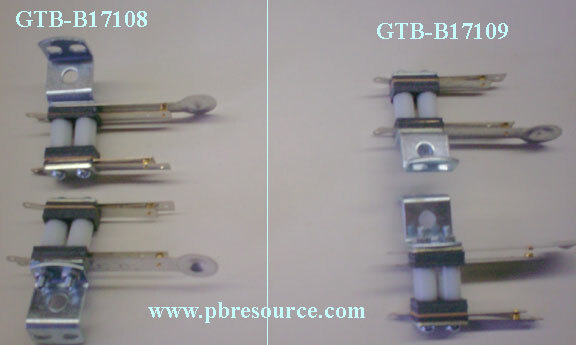 Our Enhanced Gottlieb® parts are a great substitute! 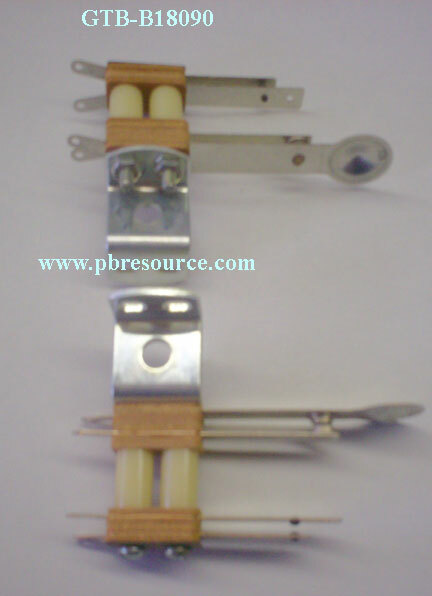 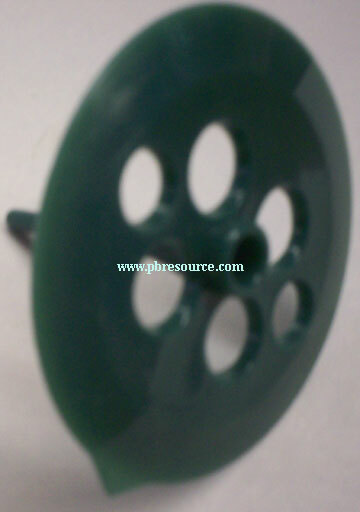 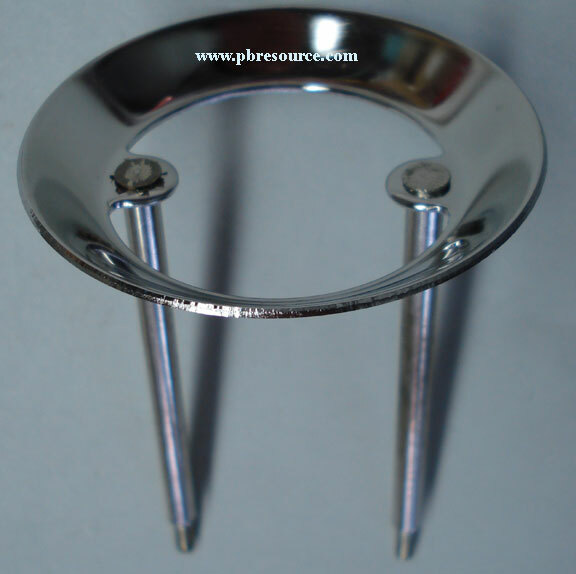 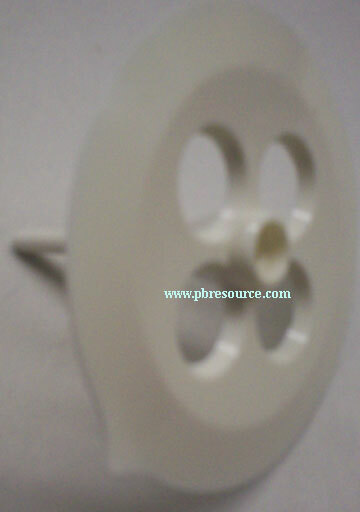 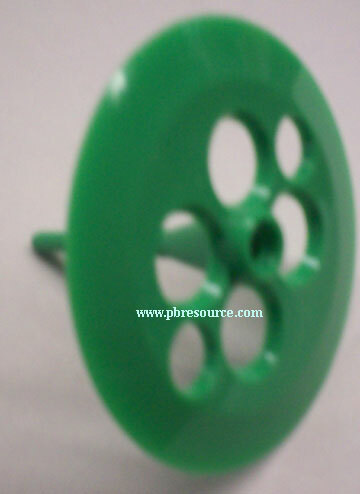 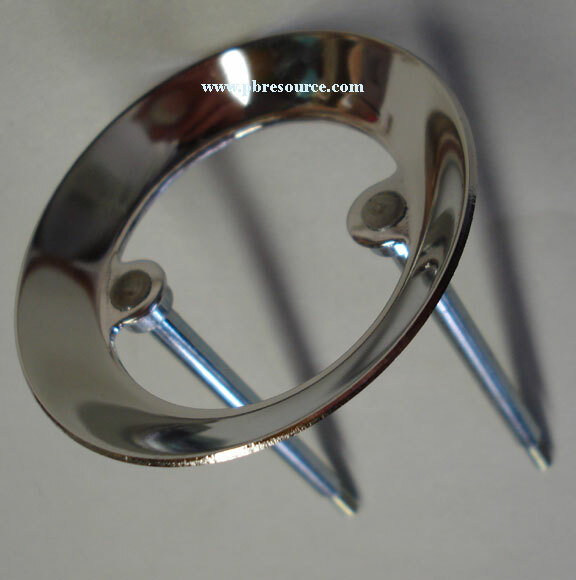 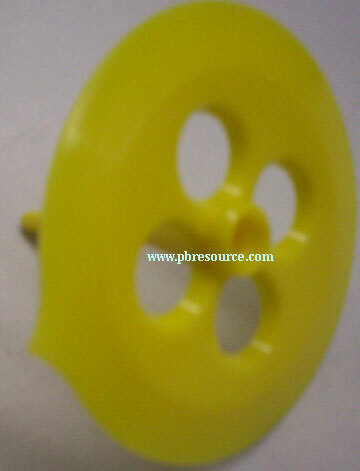 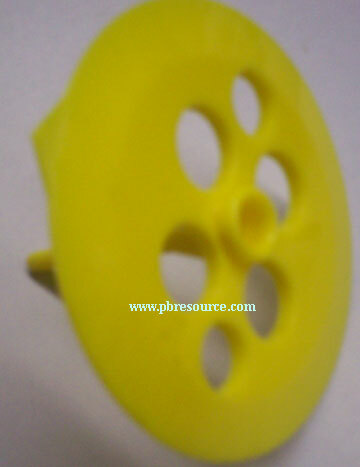 The Substitute Enhanced Yokes must be used in pairs(Metal Yoke and Fiber Yoke)! 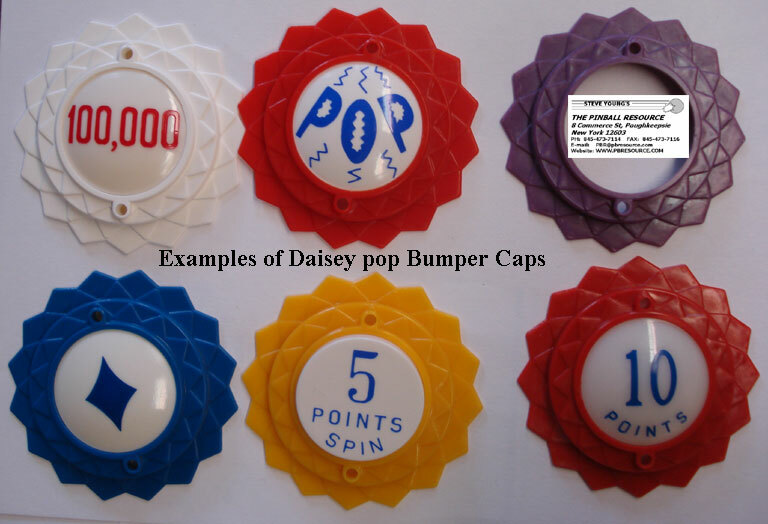 Bally Thumper Bumper Plungers and Yokes used on games from the 1960's through Truck Stop. 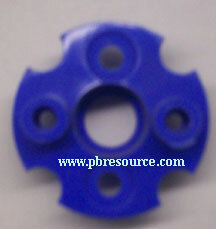 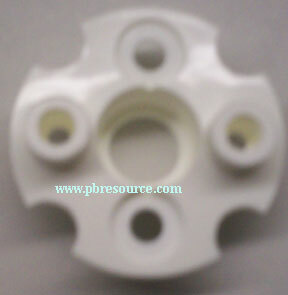 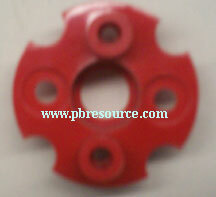 We recommend our Enhanced Gottlieb® Yoke parts as a substitute! 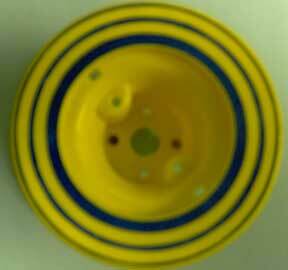 The Enhanced Yokes must be used in pairs! 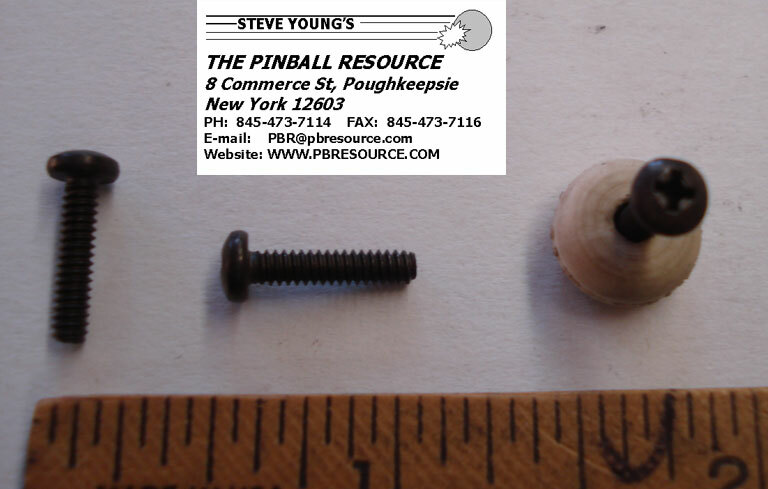 We have the following parts in a limited quantity for those that want to keep their games using only Bally parts. 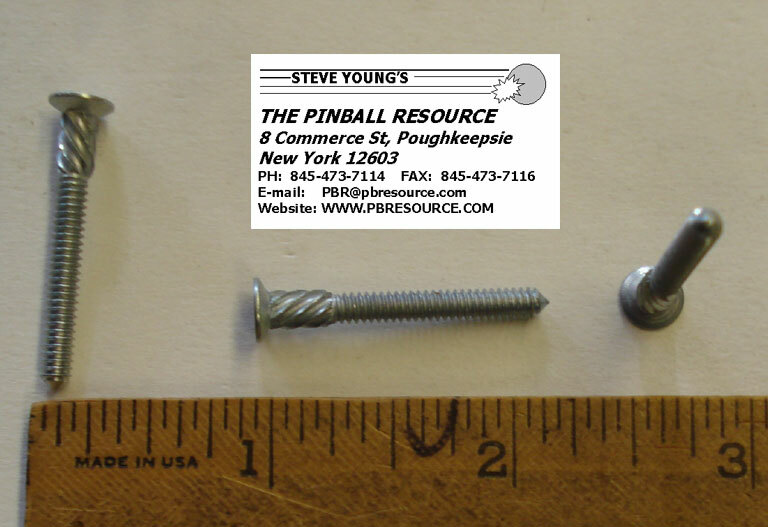 We have the following parts in a limited quantity for those that want to keep their games using only Old Stern/Chicago Coin parts. 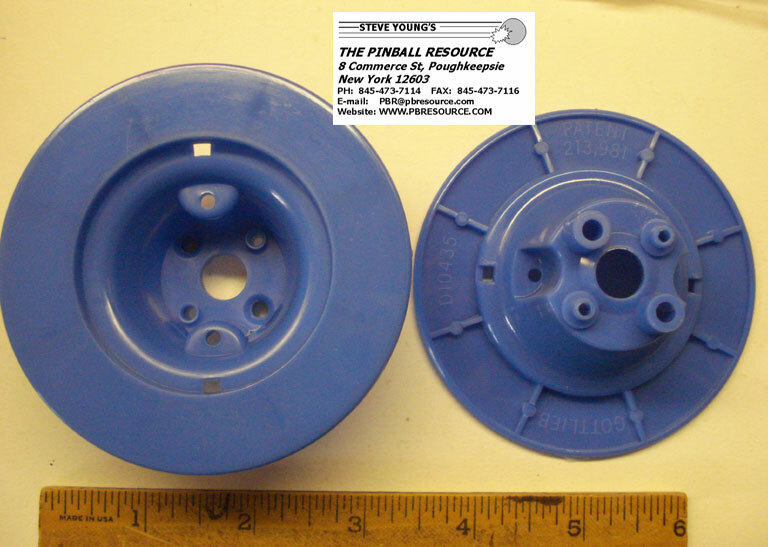 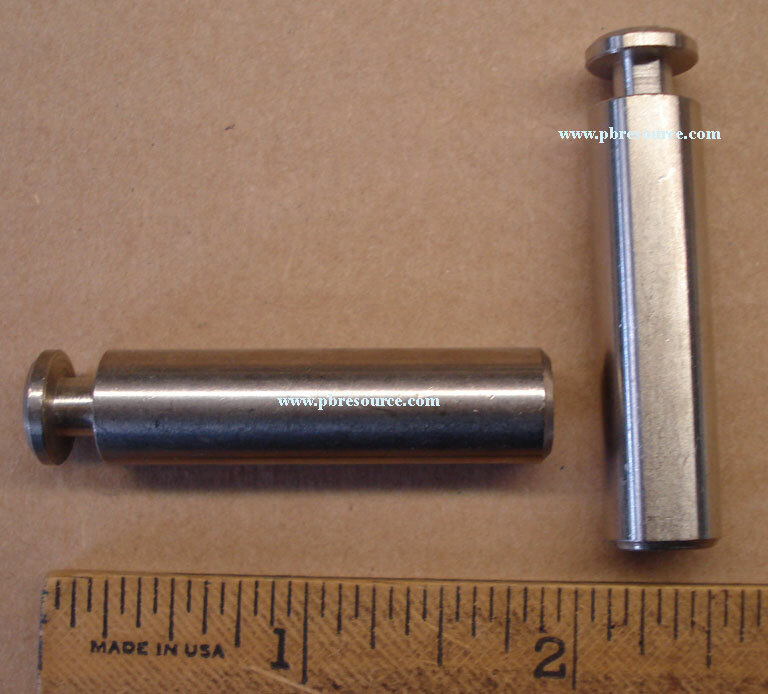 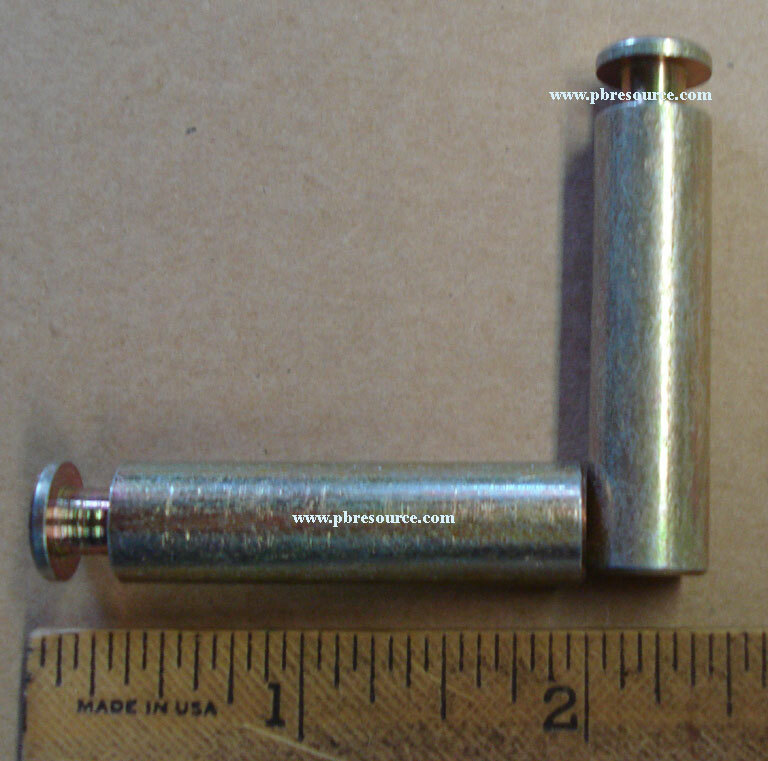 Old Stern Thumper Bumper Plungers and Yokes used on games from the early 1980's with Bumper Bodies like the thumbnail. 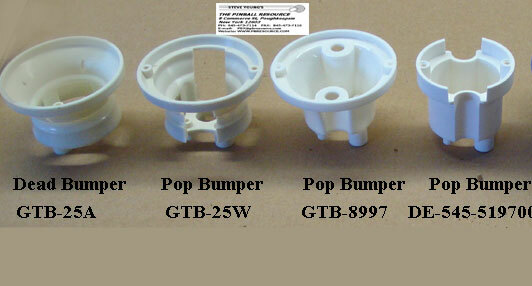 Each kit rebuilds a single pop bumper. 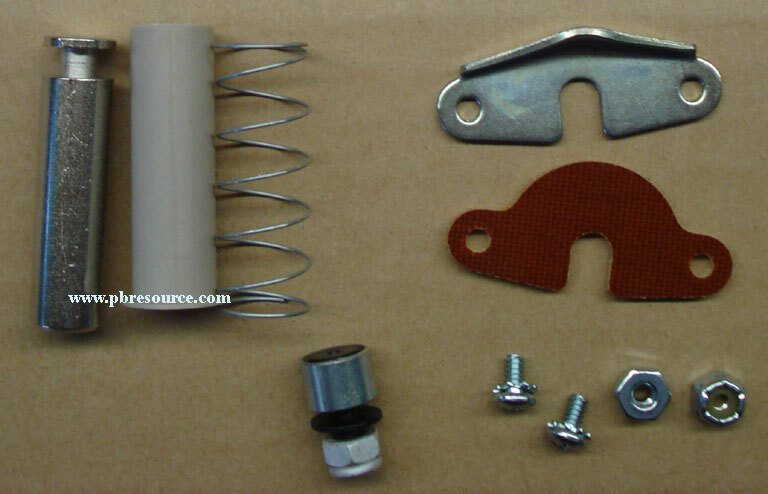 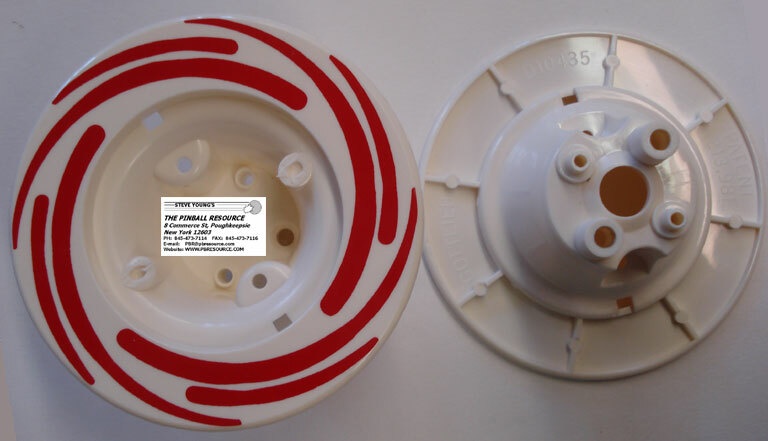 Very Late AC Pop Bumpers have 10-32 style Coil Stops which can be replaced by the one in this kit if centered carefully. 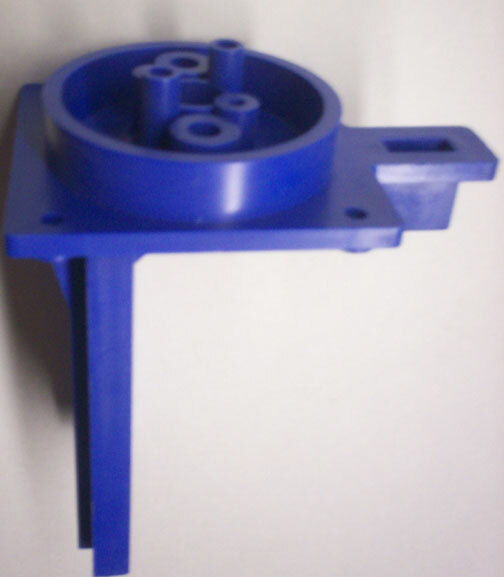 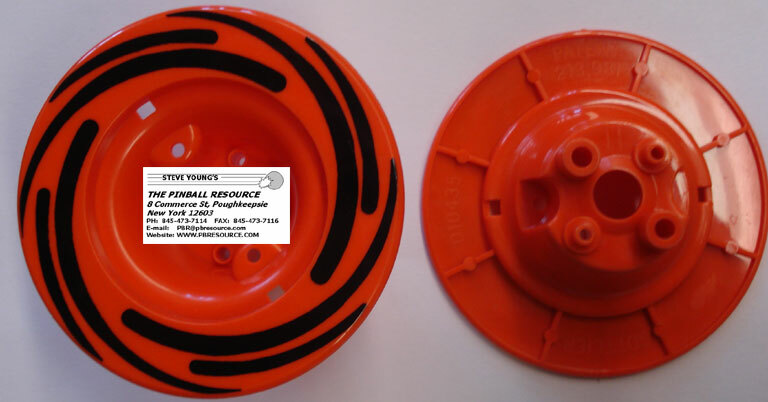 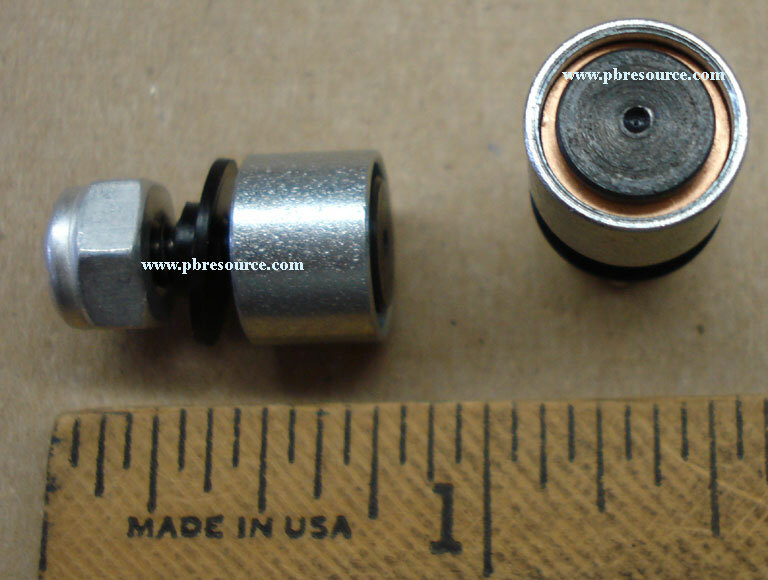 We have redesigned the plunger, which allowed us utilize the Gottlieb® bakelite and metal armatures with this new plunger to give new life to these tired assemblies. 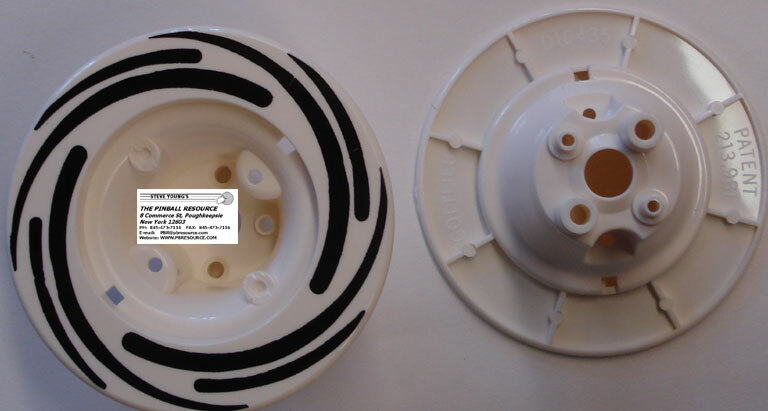 The redesigned plunger is not available separately. 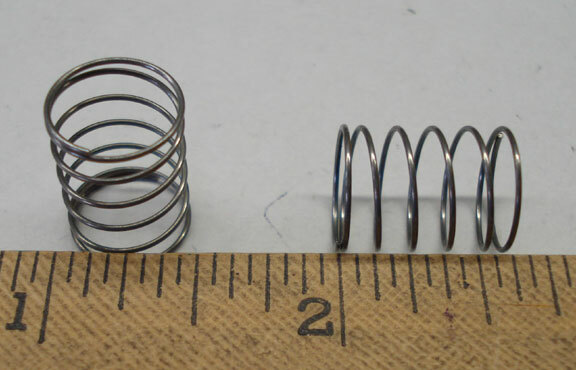 A-8574, and A17187 are not currently available. 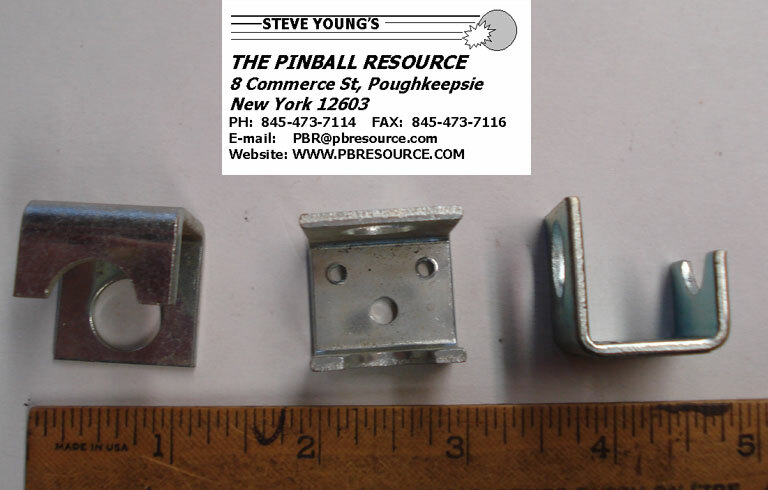 If your bracket is in good shape, you can grind off(if riveted) or just unscrew and replace the coil stop with our A4862+. 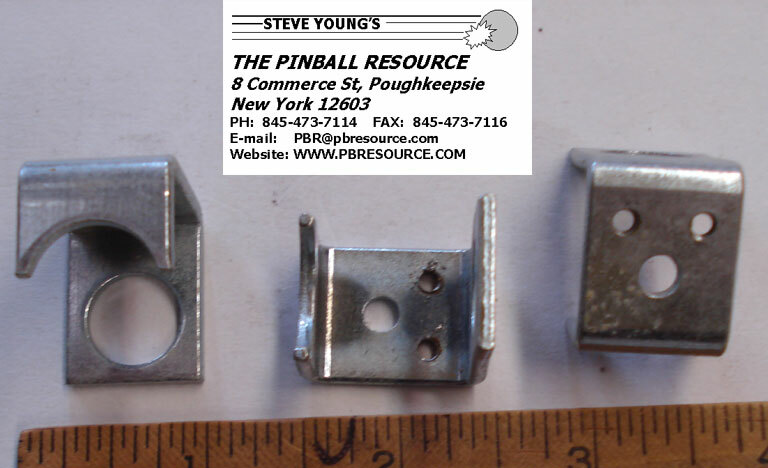 On Bracket A17187, the hole for the coil stop will be larger than the width of the coil stop, just center the stop in the hole and tighten. 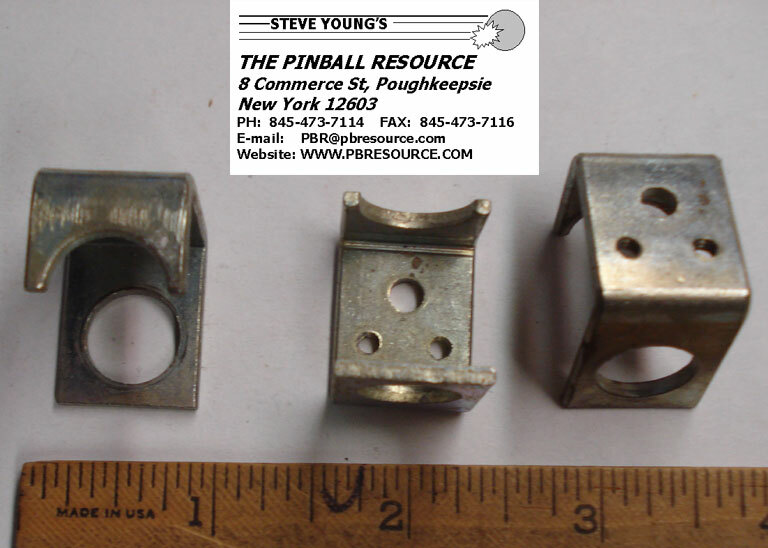 Covers System 1, E/M Games 12/1977, System 80/A/B, and System 3 games. 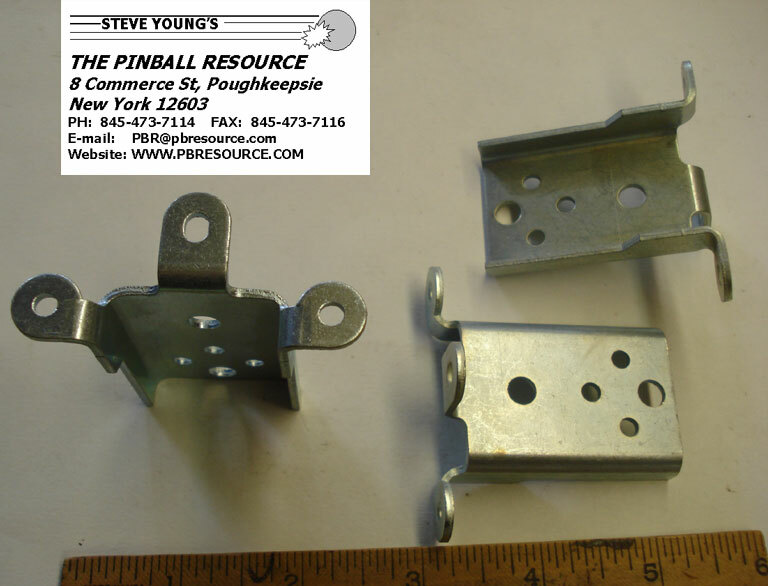 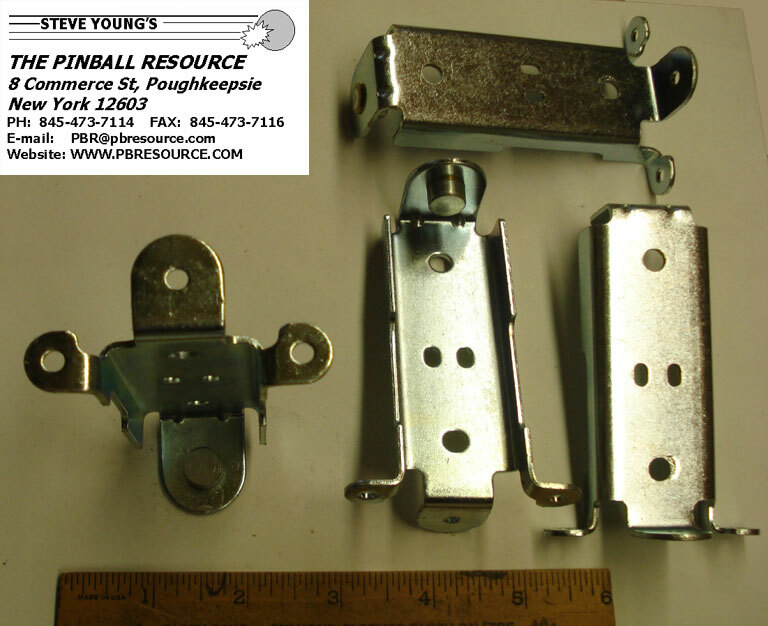 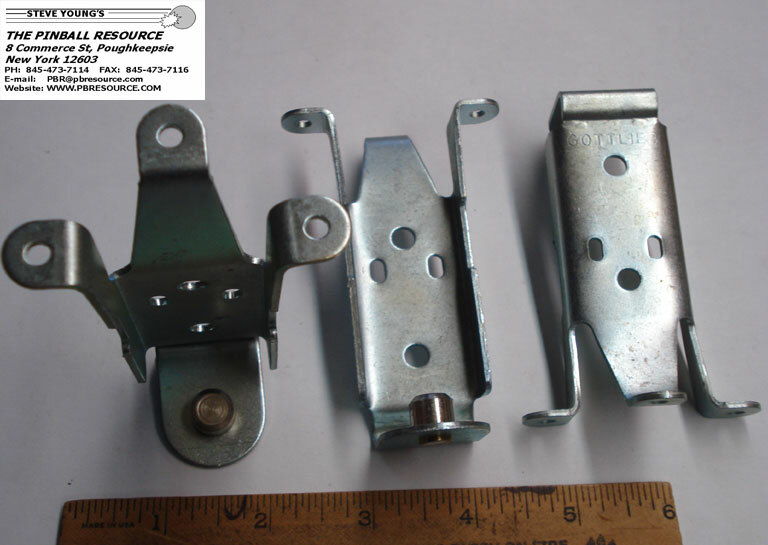 If your game has a single piece bracket, use A-613-37, if your game has a coil stop that screws to the bracket, use coil stop A-613-67(Bracket not available). 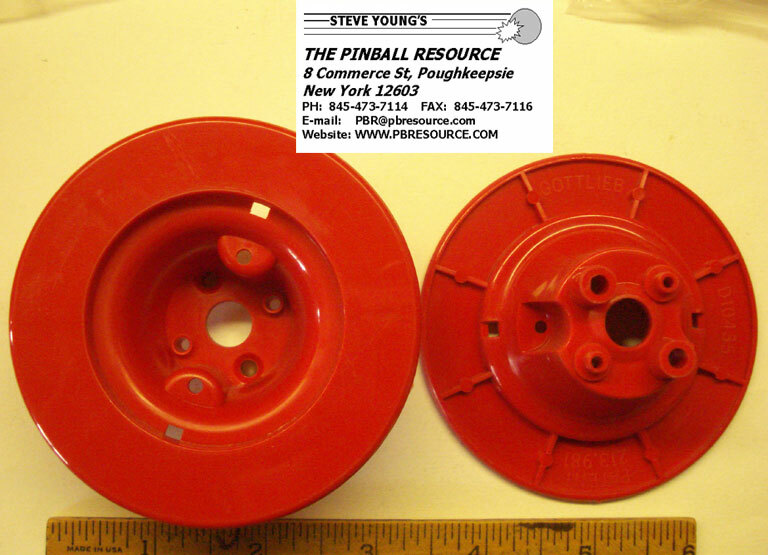 for Early Solid State games through Flash Gordon 01/1981. 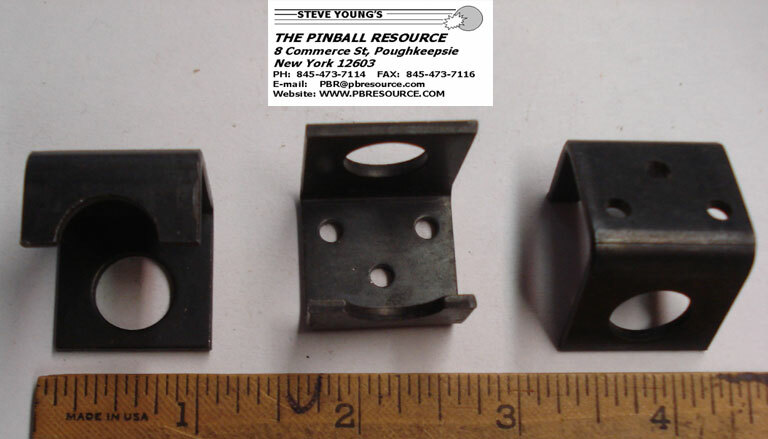 for Solid State games Eight Ball Deluxe through last Bally Game(Snap-In-Caps). 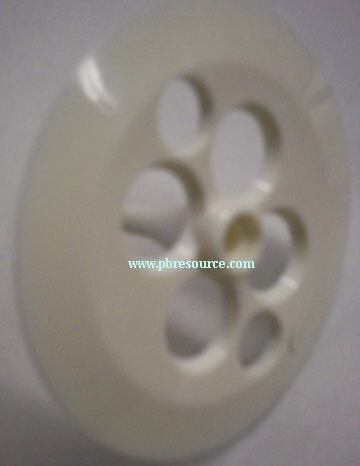 These are NOS Gottlieb® clear adhesive mylar halves for the Pop Bumper. 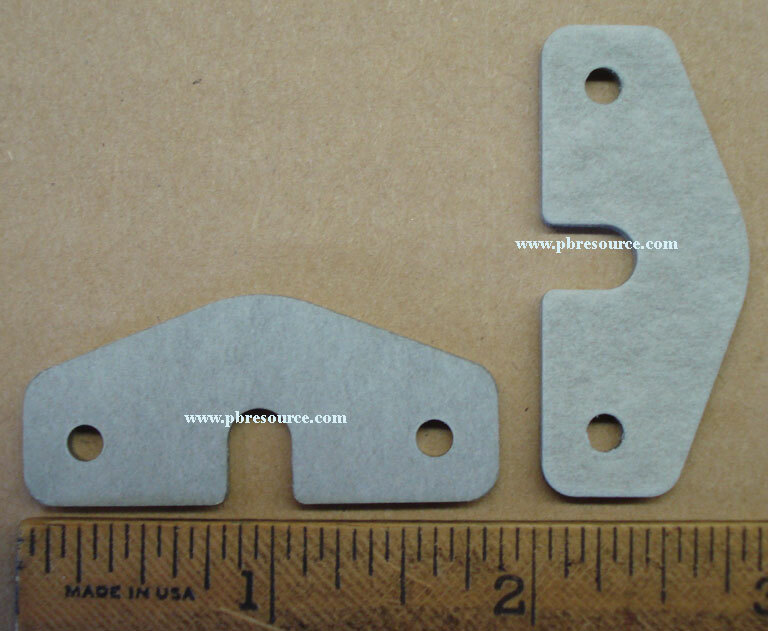 These Halves are great if you want to add Mylar protection to your pop bumpers without having to dismantle the pop bumper. 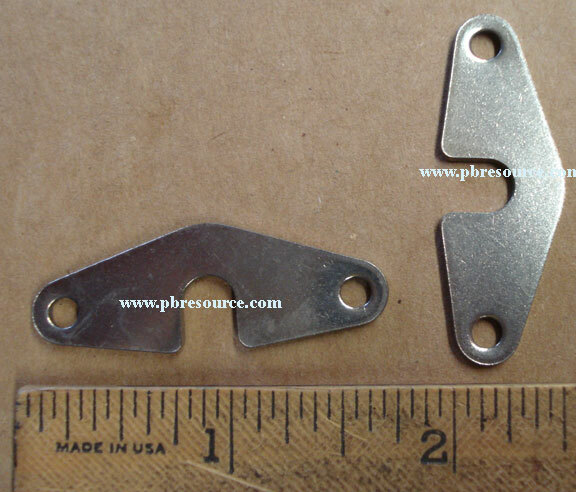 Since these are Halves, you need to purchase Two to protect a single pop bumper. 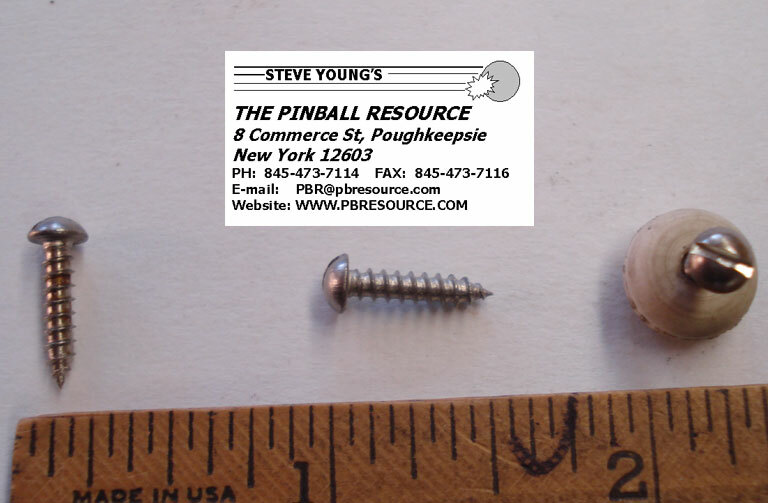 Click on the thumbnail to see the actual size. 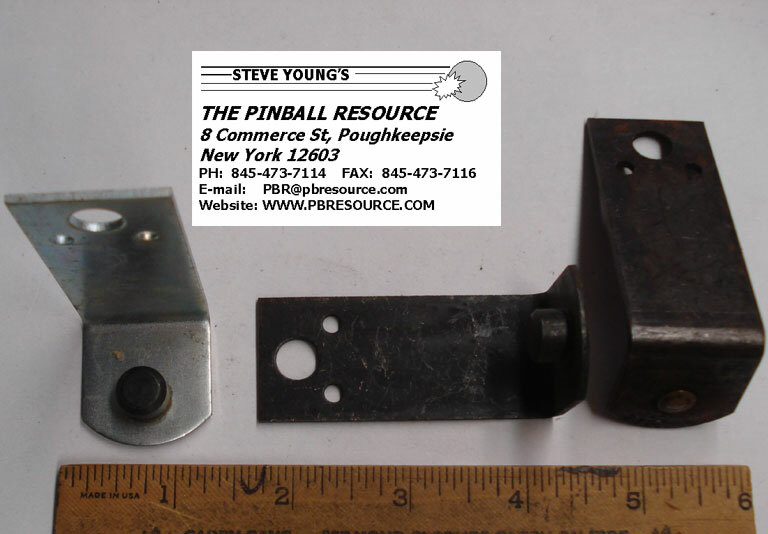 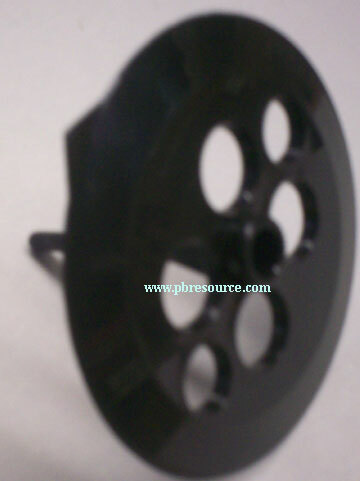 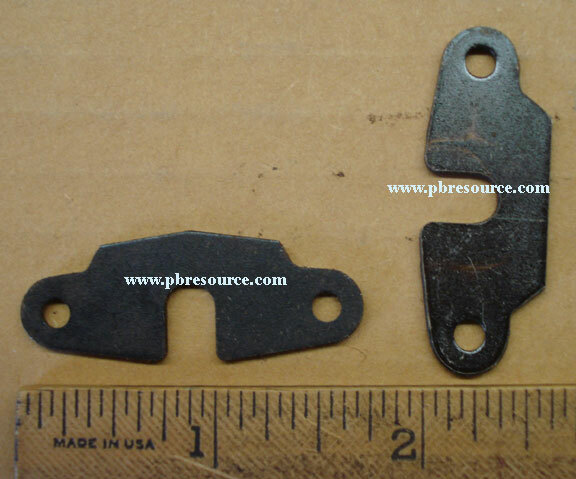 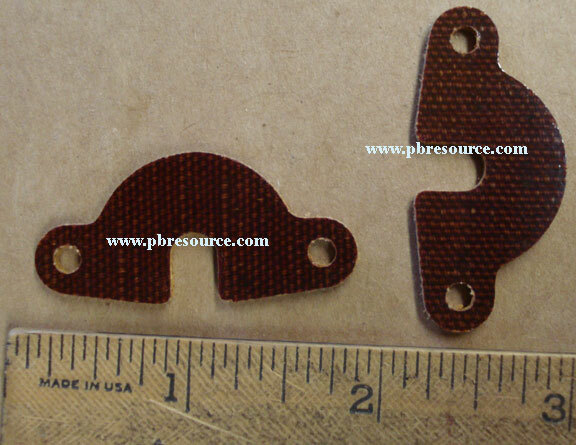 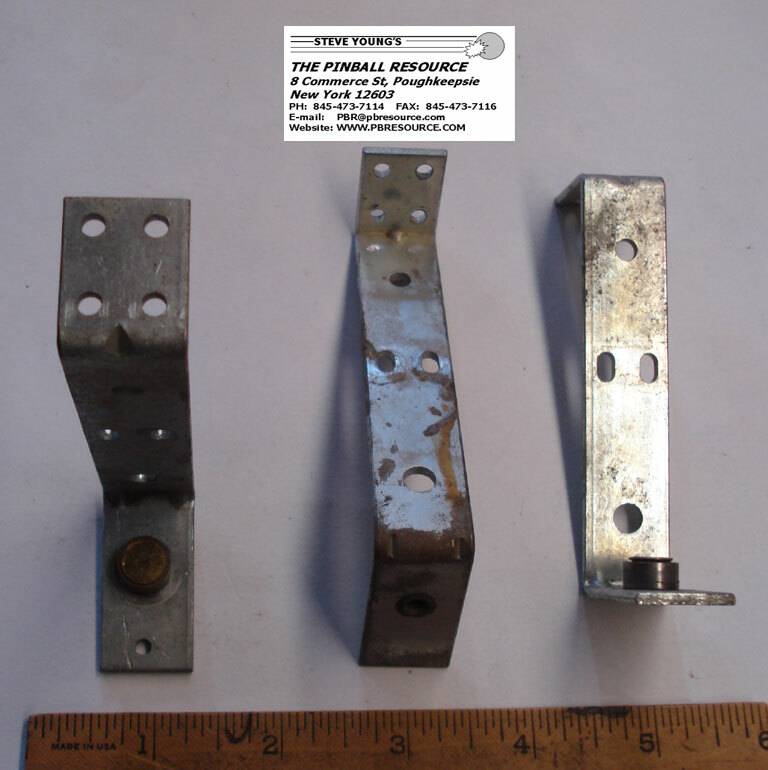 A Williams part 03-7395, but can be used as a substitute for Bally C-921, Old Stern B695-6, and Data East/Sega/Stern 545-5610-01 if you enlarge the 2 mounting holes. 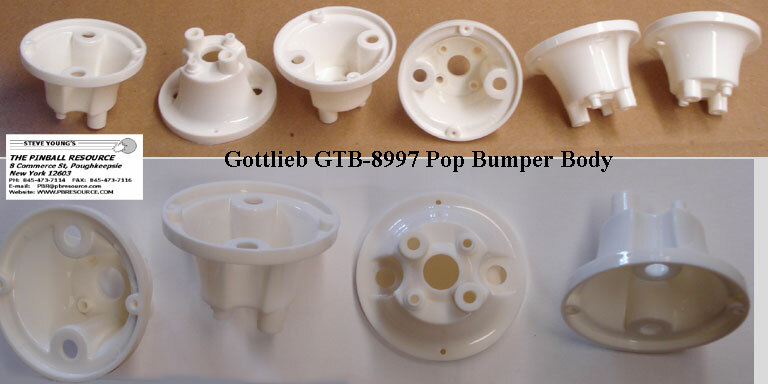 Turns a Gottlieb Pop Bumper Body into a Dead Bumper Body! 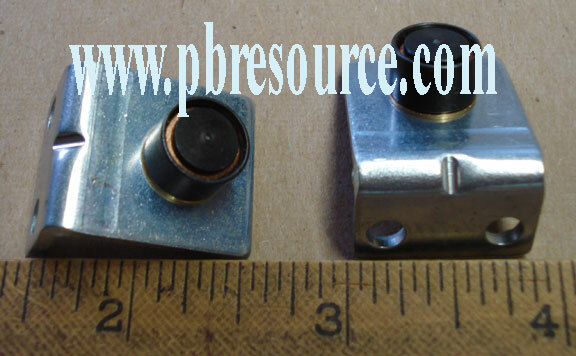 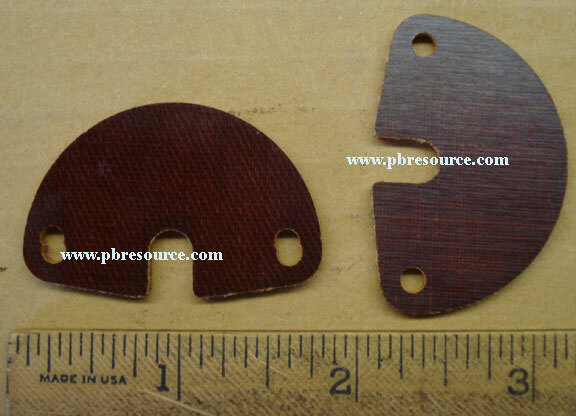 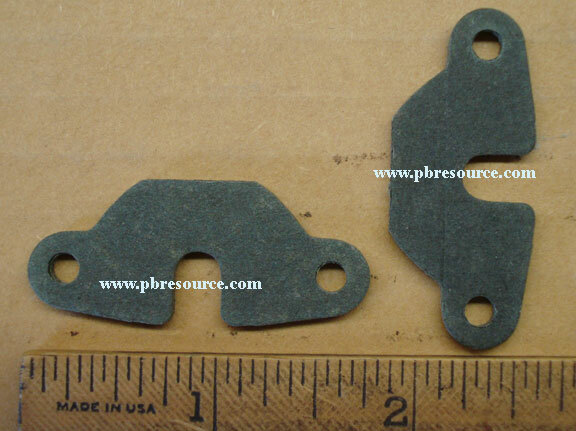 Used on Gottlieb Bodies A10436, A13904, A13905, A15980, and 26860. 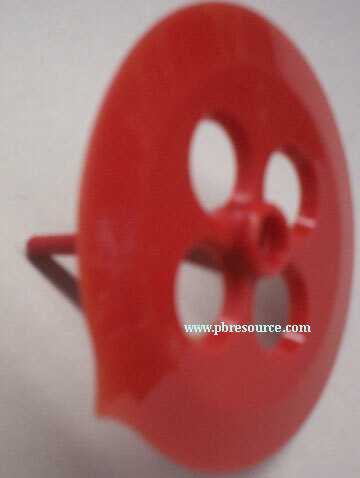 Used on games like Buccaneer! 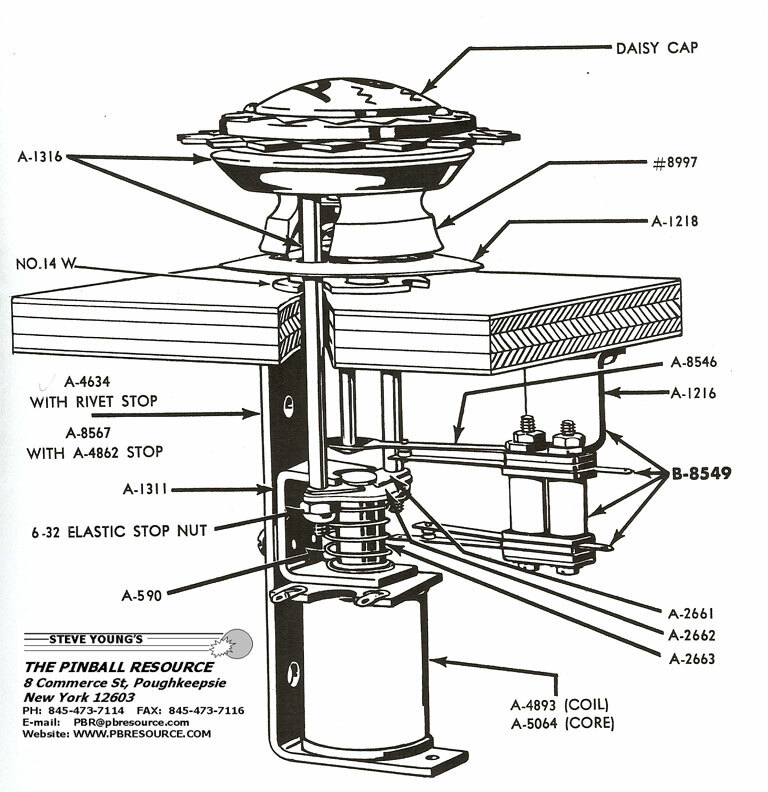 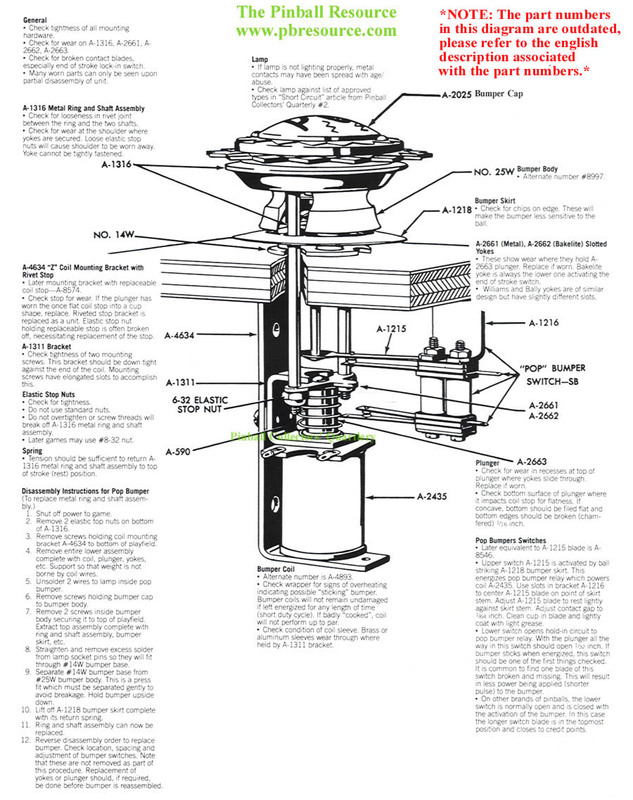 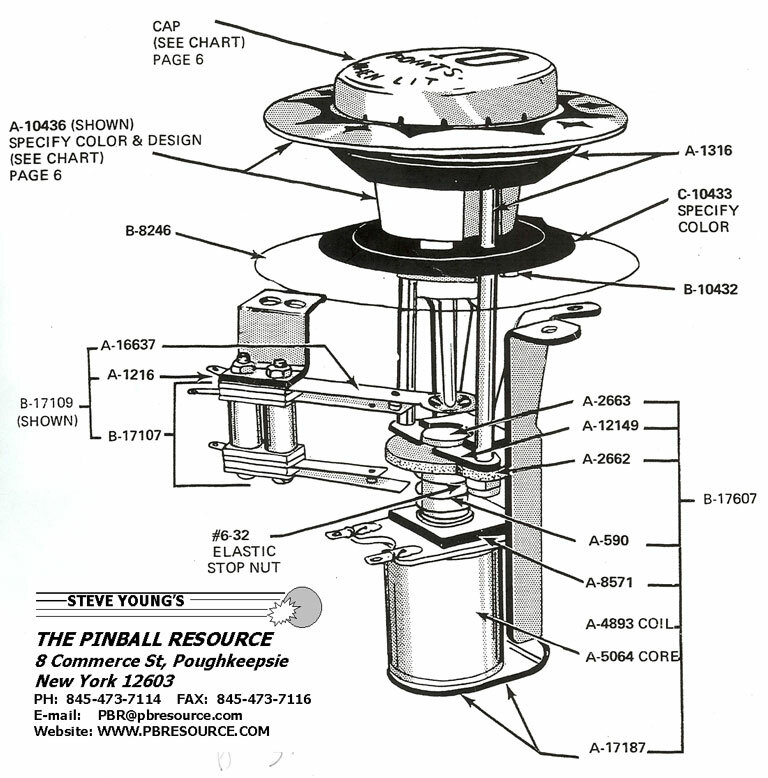 NOTE: The part numbers in the diagram are out-dated, please refer to the English description associated with the part number. 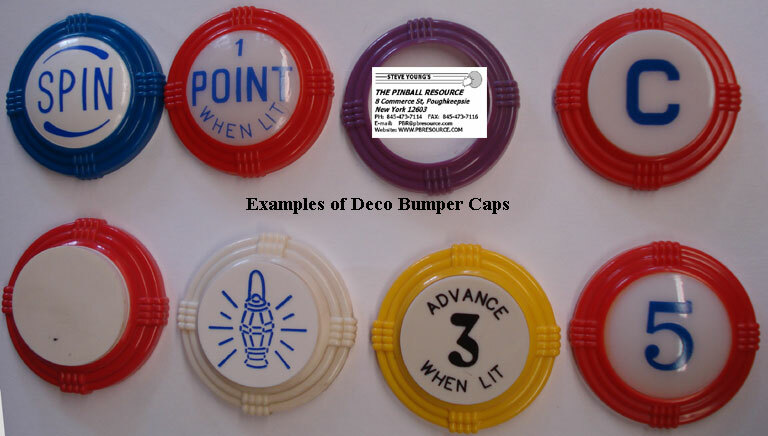 All caps designs are presented for reference only, to help customers identify the caps that are needed for their specific games. 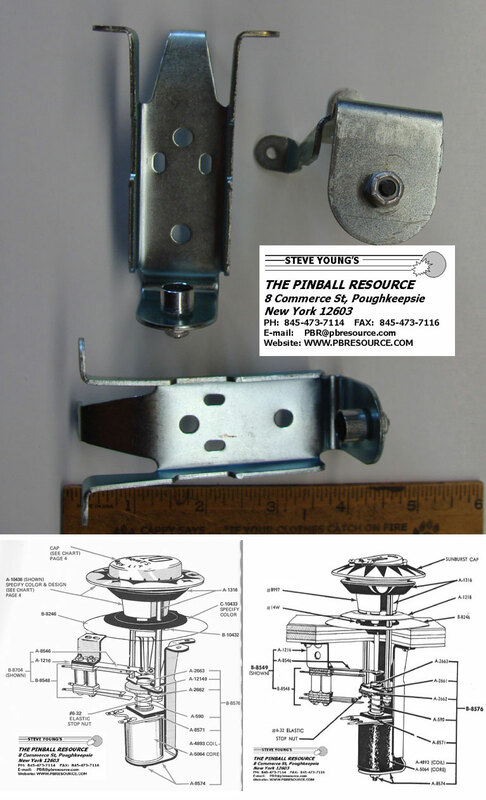 All Gottlieb® cap designs are copyright Gottlieb Development LLC ® and secured by The Pinball Resource under this license. 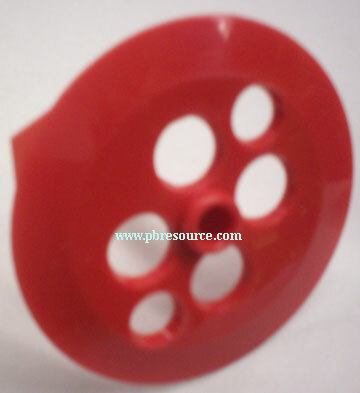 All Rights Reserved!